Yesterday I took part in the inaugural Southend Triathlon. I’m going for shorter, smaller, local races this year, so when it was announced there would be a sprint triathlon in Southend, I signed up straight away. Southend is seaside town where I spent a lot of time as a child in the arcades and amusement park. The beaches in this area have always been muddy, pebbly and not particularly clean. I was questioning my sanity about actually swimming in the Thames Estuary! Arriving at the venue, we saw that the tide was still way out with small boats lodged in the thick mud. I imagined this turning into a mud run rather than a triathlon! The weather was beautiful and there was a great atmosphere around the registration area. I saw my coach Jon in transition, plus several clubmates who were racing. Being a local event meant that plenty of friends and family came down to support. By the time my wave was due to start at 12pm, there was just enough water to submerge ourselves in. Underfoot was very sharp and rough, I hobbled out to the buoys marking the starting line. We were able to leave our flip-flops in numbered bags on the beach to collect after the race, which was a nice touch. The water temperature was fairly warm but it didn’t smell great! I was a little late to hit start on my Garmin as we were set off quicker than I expected. Turning to breathe, I could see a drone buzzing above my head and crowds of people lining the beach. The water was a grey/green colour and tasted as bad as I expected. It was very easy to sight as I just followed the shore line, occasionally looking forward to check I wasn’t going to collide with a boat. There had been some confusion over whether we would be swimming with the tide or against it. I couldn’t really feel the water pushing or pulling me, so I’m still not exactly sure. Being just a 500m swim, it was over very quickly. Soon I was staggering out onto the purple carpet and handing back my swimming cap, so the marshals could count us back in. I wore my new HUUB wetsuit which slid off easily- no more wrestling the sleeves off my arms! As usual, I felt totally dazed and confused after the swim. I could hear friends and family calling my name, but I couldn’t recognise their faces. The first time I’ve ever managed to lose my bike in transition! I ran straight past it then backtracked trying to spot my zebra print towel. My friend Lee helped from the sidelines and eventually I found number 36 on the racking. The course began on a bike path before heading out on country lanes to Great Wakering and Barling. There were marshals controlling the traffic at this junction, so I didn’t need to stop when joining the main road. I cycled the bike route a few weeks ago so I was familiar with the course. It’s dead flat, but there are quite a few twists and turns- not ideal for me as I’m rubbish at cornering. Southend always seems to be very windy, but fortunately it was very calm on race day with just a slight breeze. I was unlucky and got held at a red light in Shoeburyness on the way out and then again on the way back in, I’m sure this added at least 5 minutes to my time! I got into a game of ‘cat and mouse’ with a lady in a neon yellow and blue trisuit. She would overtake me then a mile or so later, I would pass her again. It was great fun and we helped push each other along, briefly chatting as we passed. Turns out she is a member of my coach’s triathlon club. 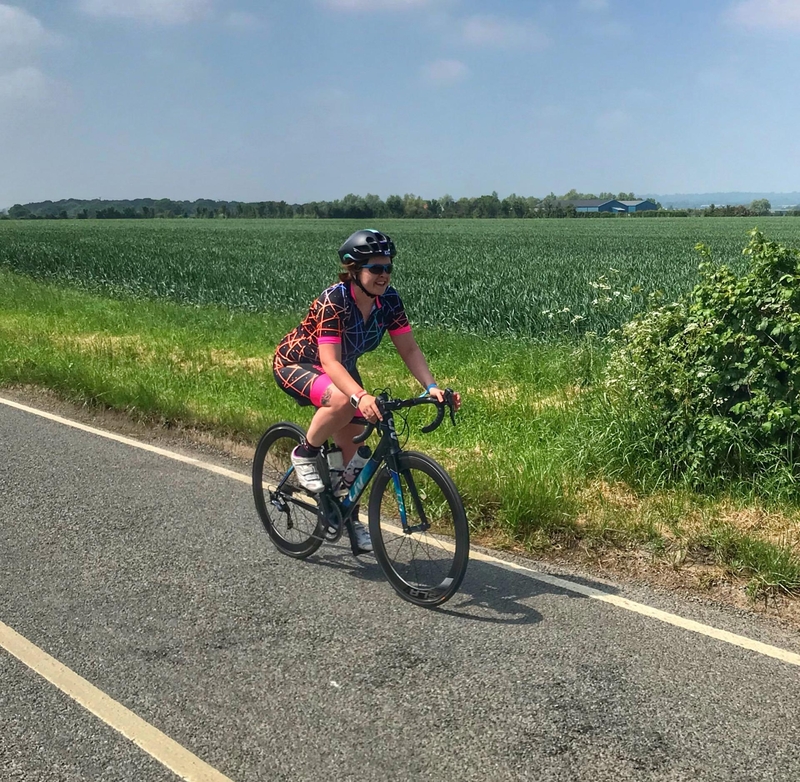 Plenty of men overtook me on the bike course, but I was quite pleased that no females passed me except for elite triathlete Alice Hector who eventually won the race! My second transition went smoother than the first. I found my place on the racking fairly easily, changed my shoes and headed out on the run. The run was a straight out and back along the seafront. On a sunny bank holiday weekend, the promenade was crowded with people so there was a lot of weaving and dodging involved. I grabbed a bottle of water at the start of the run and poured it over my arms and chest. By this point in the day, it was very warm and there was no shade for respite. Running is always my weakest area in triathlon, I felt like I was moving at a snail’s pace. I started feeling quite sick, there was a smell of greasy chips mixed with paint from one of the beach huts. I could feel my skin burning, despite having put on SPF30 before the race started. I saw Glen and a clubmate Paul flying past on their way back to the finish line. Eventually, I reached another water station and then the turn-around point. Only 2.5km then I’m done! Around 500m to the finish, my brother Sean ran past me. No way was he overtaking me at this stage! I tried to keep up with him, but after about 5 steps I gave up and let him run on! I finished in 1:28:26, I was aiming for sub 1:30 so I was pleased with my overall time. I wish there had been age-group prizes as I actually came 3rd female 30-34, but a small event like this would only tend to award overall prizes. The marshalling at this event was quite poor in certain areas. Some of my friends who came to support ended up helping near the finish line as people were wandering onto the course in front of people still running. Other than this, I was pleasantly surprised with the Southend Triathlon. It was a fantastic day and made even better by the support on the course. Thank you to Lee, Nick, Andy Kenyon and Sundried for the photos. Did you race this weekend? Do you prefer shorter or longer distance races? I’ve not raced since the Wings for Life but I have a 10 miler this Sunday. This was such an inspiring post to read. You’re amazing!